Description: 2432 and 2577 roll past the depot, as they head for the Durand Yard. Description: After pulling the Tank Train out of the Yard, 2577 and 2432 pushed the train back onto the Flint Sub, and went to pick up the rest of their train, which they had left in the Siding west of town. Having picked up the rest of the train, The two locomotives head past the Durand Depot as they head east. Description: 2577 and 2432 depart the Durand with, much to everyone's Surprise, a GATX Tank Train! Description: A light power Move of CN 2577 and 2432 heads through the Chicago Wye as it heads for the Holly Subdivision. Description: 2577 and 2432 enter the Holly Subdivision. They would go as far as the siding, about 100 feet south, and then reverse into the Durand Yard. Description: CN 2577 leads NS 9623 and NS 7036 with a southbound train on the NS Buffalo mainline, which appears to be a very tight fit, through Sunbury, Pennsylvania. Description: CN 2577 leads NS 9623 and NS 7036 with a southbound train on the NS Buffalo mainline through Paxton, Pennsylvania. Description: Train A405 comes through Cardigna Jct doing 40 mph as it nears New Brighton, MN with two CN Dash 9s. Picture was scanned in. Description: After watching two CSX trains blast by, I am finally actually set up to take some shots. 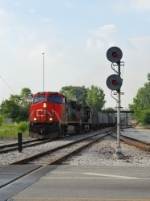 First up is this CN movement on the old Trunk, seen here passing the only two target signals (or older style signals of any kind) left in existance here at Blue Island's diamonds. This was a land barge as well, easily over 160 cars!